What is a Badminton Backhand Drop Shot? It is a steep angle shot performed from the rear court to your opponent’s fore court. 1. Move into position and adopt the Backhand Grip. 2. Keep your Racket Arm as close as possible to your body. Make your your body is relaxed. 3. Bend your knees slightly. This will make you feel more comfortable. From this step onwards, your swing should be one smooth and continuous motion. This means that you shouldn’t stop at all once you’ve started your backhand swing. 4. Perform the Overhead Backhand stroke. Use some wrist action to direct the shuttle downwards. Make sure you complete your swing. 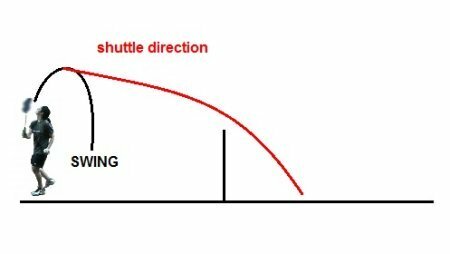 Avoid hitting the shuttle by merely ‘touching’ it. 5. Take the shuttle at the highest point possible. 6. Follow through and recover. Why Beginners Fail to Master the Backhand Drop? This question not only applies to the backhand drop. It also includes all backhand shots. So let me rephrase: Why beginners fail to master the Badminton Backhand? Incorrect Backhand Stroke Technique. The quality of your Backhand Drop depends on how well you perform your Overhead Backhand Stroke. Look at it this way, weak strokes produce weak shots. to take the shuttle at the highest point. Fast or Slow Drop Shot? Remember there are two types of Drop Shot; the Fast and Slow Drop Shot? As a beginner, I’d recommend learning the Fast Drop Shot. Forget about the Slow Drop for your backhand. When I perform my Slow Backhand Drops, I’d slice the shuttle a little. Slicing is an advanced technique. And I wouldn’t recommend you to learn it unless you have very good basics. Common mistake. When hitting the Drop Shop, do not just ‘touch’ the shuttle and call it a shot. Hit it with a complete swing using the proper Overhead Backhand stroke. Do not use the backhand unless you are really forced to. Smart opponents will always try to hit the shuttle to your backhand area. Always try your best to take it with a forehand shot.